Luke has gained a good grasp of Java by watching the videos in TheNewBoston.org. 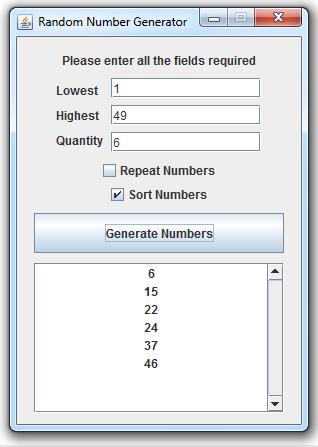 In this program of his own design, he displays random numbers in the quantity and range supplied by the user. His use of extensive validation is exemplary. The following screenshot shows the result of processing an acceptable input. We have used the Oxidizer facility in Oxygene for Java within Visual Studio to convert most of the Java code to Pascal syntax and then made a few manual adjustments where necessary. See both Luke's original Java source code and our Oxygene for Java version on the following pages.